Remember those cold winter weekend mornings at Grandma’s house? If you were lucky, she had a wood or gas stove you could snug up against while watching Bugs and Daffy punk Elmer. You’d look out the window at the frosted yard and start planning your fun while incredible smells and sizzling sounds came from the kitchen. It was food that stuck to your ribs while you were out there playing with your cousins, or helping Pa with the firewood, or maybe wandering the ridge for a couple of squirrels with Dad. Platters and bowls covered the table — scrambled eggs, bacon, hash browns, sausage, homemade biscuits, and steaming gravy fresh from the skillet. So you stuffed yourself and hit the door with enough calories in your belly to power through anything the day could offer. You don’t have to go back to grandma’s to find this quintessential country breakfast. You can find it at Stoby’s. And it goes by the name of breakfast blast. Everything is prepared in-house — just like grandma did. 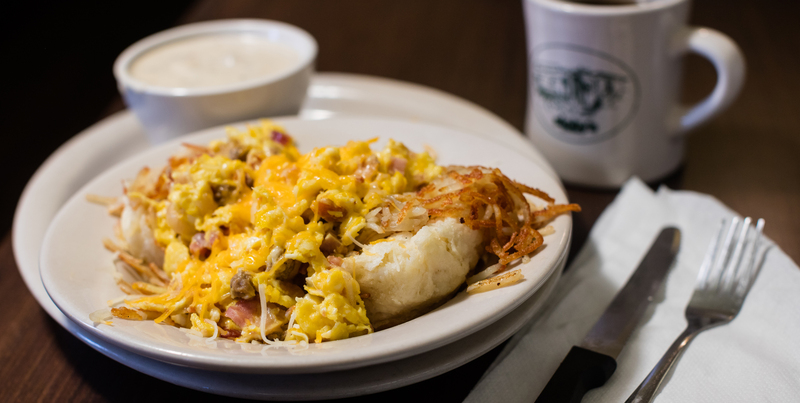 Stoby’s starts with a made-from-scratch biscuit, then they layer that Southern goodness with hash browns, sausage, bacon, ham, scrambled eggs, a blend of cheeses, and serve it with a side bowl of gravy. You know what to do with the gravy. Chow down and fuel up for a winter’s day then order another breakfast blast to go and visit your grandma.